My husband was killed in Iraq on Feb.14, ‘07. Your Heaven book has brought much comfort and anticipation of our reunion. Thank you and may God bless you and your work for our Lord. — S.S. Your book, Lord Foulgrin’s Letters, was refreshing. I wanted to thank you for writing a book that revisits some of C. S. Lewis’s ideas. 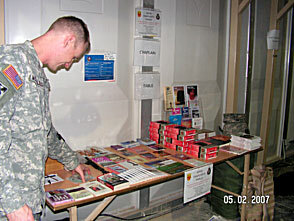 I actually picked up the book to read during deployment in Operation Iraqi Freedom. I couldn’t put it down and completed it before we even headed north out of Kuwait. As a soldier, I face many of the demons you mentioned. I see and live in a world that I’m glad my family does not have to see. I am an Air Force family practice physician who was stationed in Iraq from May through July of this year. The reason I am writing to you, is that I had the pleasure of meeting a Christian army aviator during my time in Kirkuk who gave me a book entitled The Grace and Truth Paradox. It was a wonderfully concise, yet incredibly potent description of the character of Christ. I enjoyed it tremendously and was afforded the opportunity to share it with others. I am confident my wife will also enjoy your book upon my return to the states this month.